The Fels-Groves Farm Preserve in Yarmouth is a 55-acre parcel of mature woods and open fields. It features 1.2 miles of trails, abundant wildlife and scenic views. The preserve was acquired in 2002 with the active leadership of the Maine Coast Heritage Trust. It is now owned and managed by the Town of Yarmouth and protected by a conservation easement held by the Royal River Conservation Trust. The Town’s website for the Preserve is here. The conservation easement covers both the town-owned preserve (both sides of Gilman Road), and also the adjacent brick farmhouse and its fields, preserving this historic neighborhood landscape forever. The brick farmhouse is privately owned, with no public access. 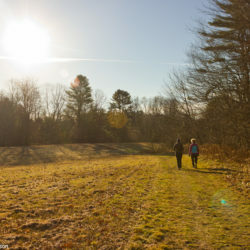 Fels-Groves Farm Preserve today serves as a primary trailhead for Yarmouth’s West Side Trail. RRCT, the Town of Yarmouth, CMP, the New England Mountain Bike Association, Yarmouth Rotary, and many others are expanding the trail network to connect to more neighborhoods. Take Route 88 to Princes Point Road. At the four way stop, turn left onto Gilman Road. 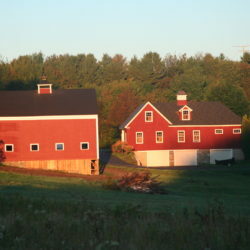 The fields of Fels-Groves Farm open up within a quarter mile on both sides of Gilman Road. Park in a gravel lot at the end of a gravel lane leaving Gilman Road on the right just past the trees. West of the parking lot is a short handicapped accessible gravel loop trail. Other trails on the preserve provide wide grassy options for baby carriages and gentle walks. Trails are described further here. 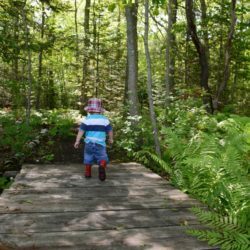 Town of Yarmouth posted rules and regulations apply; for questions contact the preserve’s owner and manager, the Town of Yarmouth. Trails are open for hiking and skiing and snowshoeing in winter. Mountain biking is allowed on the West Side Trail Connector only. The parcel north of Gilman Road has no developed trails at present, and is best explored in winter using snowshoes. Please be mindful of the neighbors’ privacy. Hunting is prohibited by the Town of Yarmouth.